The RCEME Corps tradition on Passing of the Port takes it origins from our moto, “Arte et Marte”, which is also exemplified by our unofficial tactical mission which is to “Close with and Fix Kit”. By bringing the decanter from the right to the front of you, the RCEME member demonstrates the act of tactically “Closing with” the casualty and securing it. When the decanter is clearly secured in front of them, the RCEME member then turns the decanter exactly one quarter turn to signify the accuracy of the technician using delicate precision tools. This, demonstrates the act of “Fix Kit”. The quarter turn is made clockwise to represent how we tighten a screw, which is indicative of finishing the repair. This is an essential part of the ritual, as it reminds us all that no RCEME Soldier (Craftsman, Non-Commissioned Member or Officer) would ever accept to have a drink until the job is done! Step 1: Upon passing the port to a RCEME member from the right, the RCEME member brings the Port in front of him. Step 2: Before pouring, the member turns the Port decanter clockwise by a quarter turn. Step 3: The member pours the Port in their glass. Step 4: The Port decanter is then passed on to the left. 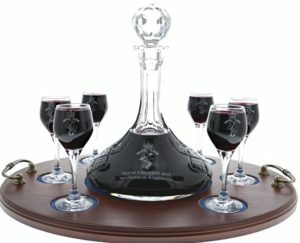 Whether the decanter touches the table or not is of no importance – there is no set ritual in the Army. However, RCEME members should adapt to the Service/Regiment Tradition of the Mess Dinner (i.e., Navy slides on table, Air Force does not touch the table).